A cruise review is not complete without talking about its huge variety of dining options. Onboard Costa Victoria, there are 7 places to have breakfast, lunch, dinner and supper, of which there are 3 restaurants (1 paid – Club ‘II Magnifico’ and 2 complimentary – Sinfonia and Fantasia). For breakfast itself, you can choose to have it ala carte (dishes served to you) at the Fantasia restaurant (on deck 5) or have it buffet-style at Sinfonia restaurant (on deck 5) or Bolero Buffet (on deck 11). 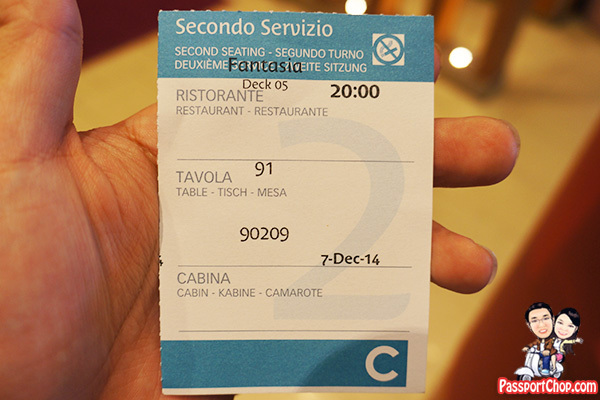 If you are not in a rush, I strongly suggest you take it easy with the ala carte dining options at Fantasia restaurant. Ala carte dining onboard Costa Victoria does not mean limited servings – you can order as many times as you want (even of the same dishes), you just have to wait for the waiters to bring your orders from the kitchen. You can order chilled juices (orange, pineapple, apple, grapefruit) and coffee, tea and hot chocolate (there are additional charges for espresso [US$1.60] and cappuccino [US$2.60] with additional 15% service charge) to go with your breakfast. 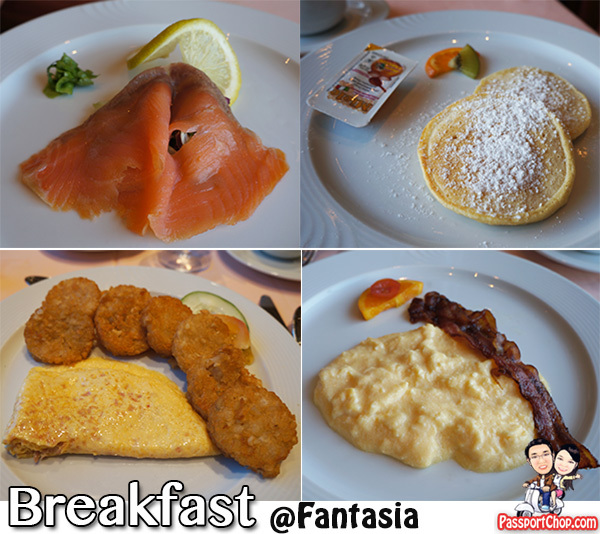 The breakfast menu at Fantasia Restaurant is the same everyday. Do note that there is an item on the menu – Marinated cold fish served with onion rings and lemon – this is not a typo. It is cold fish not cod fish (although the Chinese menu is written as 鳕鱼 [cod fish]) – as you can see from the picture below, it is smoked salmon. Dishes that are served with hash brown potatoes/bacon typically comes with 1-2 pieces of small hash brown or 1 strip of bacon so if you want your dish to be served with more hash browns/bacon strips, be very clear with your orders e.g. we specifically requested for 8 pieces of hash browns with our omelette order (see picture below). There is no dress code requirement for breakfast at Fantasia restaurant – you can come in bermudas/shorts etc. If you are in a rush e.g. catching your tender boat for your day trip to Phuket, you might want to consider dining at Bolero Buffet (on deck 11). 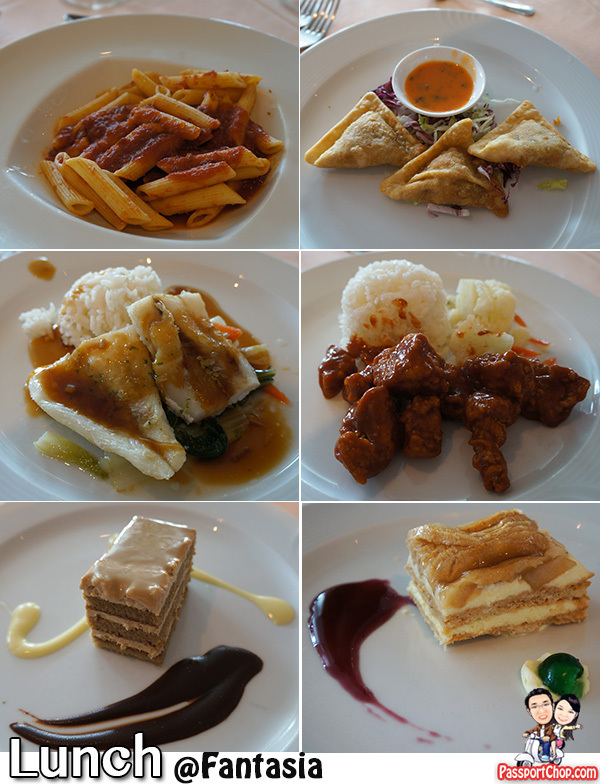 The buffet dining area on deck 11 is huge – there are 4 buffet lines (same items) laid out as seen in the picture below. 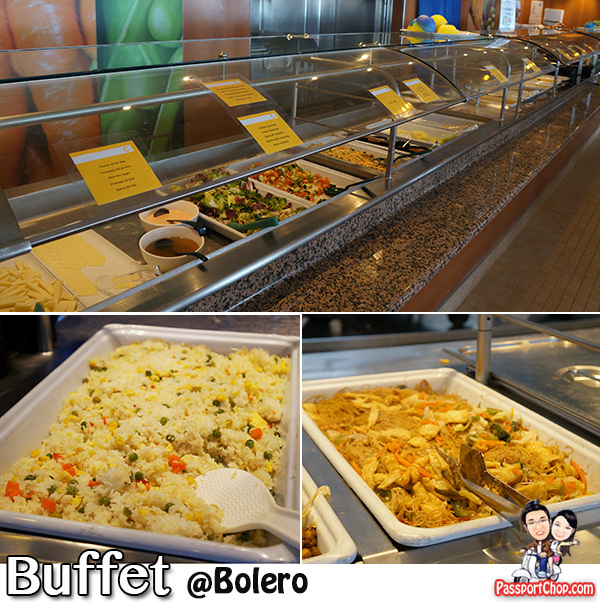 There is a wider variety of food at the Bolero Buffet. You can enjoy Western breakfast (full English breakfast) at Fantasia restaurant but here at Bolero Buffet, you can Asian breakfast (like fried bee hoon, fried rice) as well as Indian food. 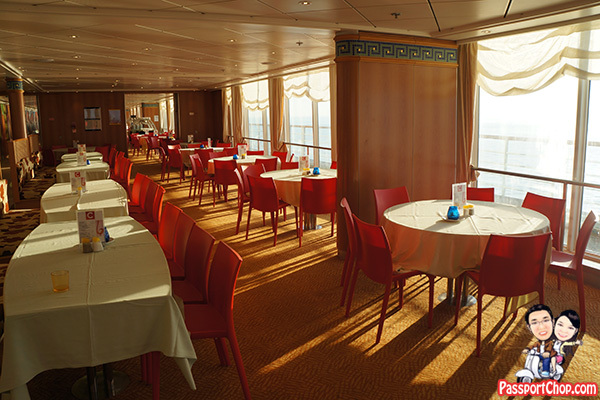 There are other breakfast dining options at Deck 12 Buffet Line and Sinfonia Restaurant. I suggest skipping those and just decide between ala carte breakfast at Fantasia Restaurant or Bolero Buffet or even both (yes you can have multiple breakfasts!). There is no omelette station at Sinfonia Restaurant so that is a huge minus for us. There are lots of seats at Bolero Buffet (see picture below for an overview of the Bolero Buffet interior). 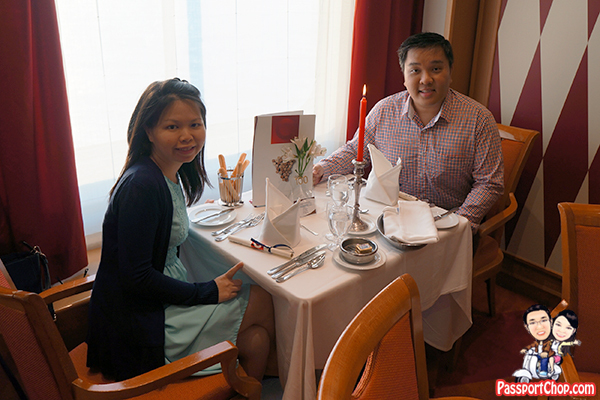 For lunch, we opted for ala carte dining again at Fantasia restaurant – Fantasia restaurant is convenient located at Deck 5 (when i say deck 5, it means level 5 of the cruise ship) – the main lobby of Costa Victoria cruise ship. No need to make reservations – just turn up for your lunch at the restaurant. You should manage your expectations with regards to food onboard cruises since these are mass produced in the kitchen for thousands of guests so don’t expect Michelin star restaurants standard (although the ala carte dining atmosphere at Fantasia restaurant feels that way :-)). We tried the chicken adobo with garlic fried rice and vegetables (fried chicken from the Philippines) and pan fried fish fillet, it was just ok. Skip the Phad Thai Rice Noodles (if it is in the menu) – it is just fried bee hoon. If all else fails, you can go with the hot dog or hamburger served with French fries. The lunch menu at Fantasia restaurant changes daily so you get to try different dishes during your trip. Again, there is no dress code requirement for lunch at Fantasia restaurant – you can come in bermudas/shorts etc. 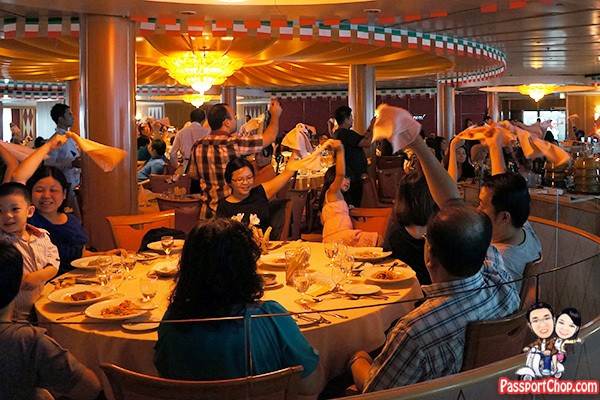 Do note that for dinner at Fantasia and Sinfonia restaurants, you will be assigned seating – your seating arrangements will be conveyed to you via a dining card placed in your cabin on Day 2 of the cruise (around 10am). There are two seatings – the first seating is at 5.45pm and the second seating is at 8pm. Both Fantasia and Sinfonia restaurants will be serving ala carte dinners. You can request for changes to your first/second seating and table seatings with the maître d’ (head waiter) directly – do so as soon as you receive your dining card. Do note that you will need to produce your dining card (as shown below) at the door during dinner and you will be ushered to your table. The seatings are timed so that you will be in time to catch the evening performances i.e. Guests with 1st sitting dinner can catch the 8.45pm show and guests with 2nd sitting dinner can catch the earlier 7.15pm show. 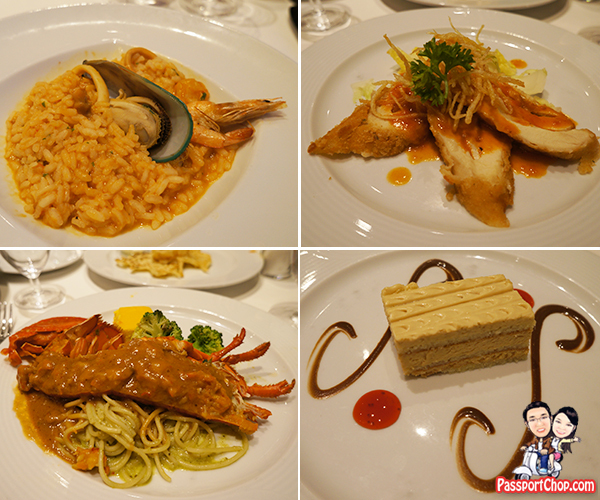 Our Gala Dinner spread was quite good – Italian risotto with seafood sauce Marinara style (very well cooked and tasty!) and Oven baked lobster with crustacean sauce, pumpkin flan and broccoli served with spaghetti in pesto sauce. The chicken cordon bleu stuffed with cheese was unfortunately quite dry but still ok. For dessert, we had the yummy hazelnut cake. 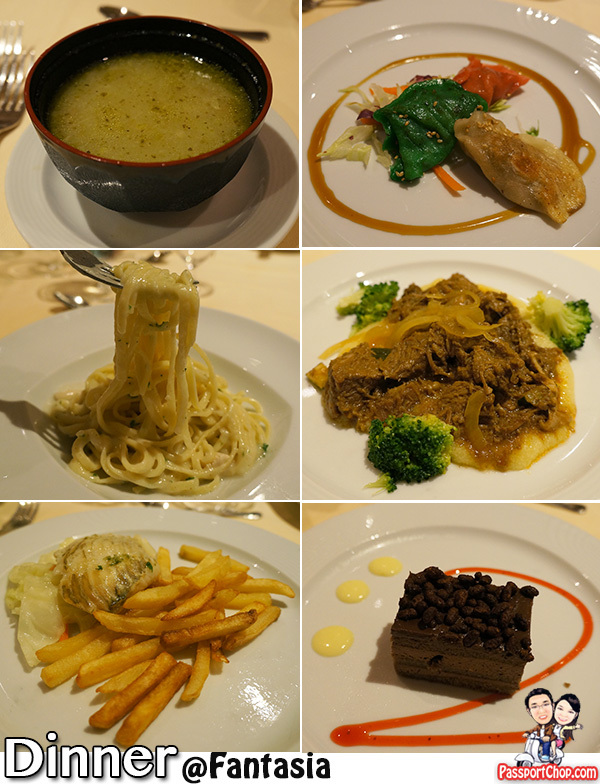 As shared in my Costa Victoria cruise review blog post earlier, we were also treated to a Venetian Dinner feast on Day 3 of our cruise. There wasn’t assigned seating for Day 3 dinner because of the stopover at Phuket (and the ship departed for Langkawi at 7pm). 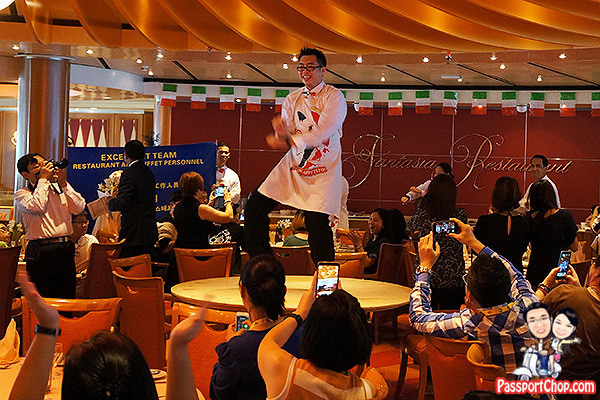 … dancing and singing by the waiters of Fantasia restaurant – even Gangnam style on a table! And everyone joined in the fun with napkin waving! All in the name of celebrating the last dinner onboard Costa Victoria and appreciating the cooks and waiters who make this cruise an enjoyable experience for guests. 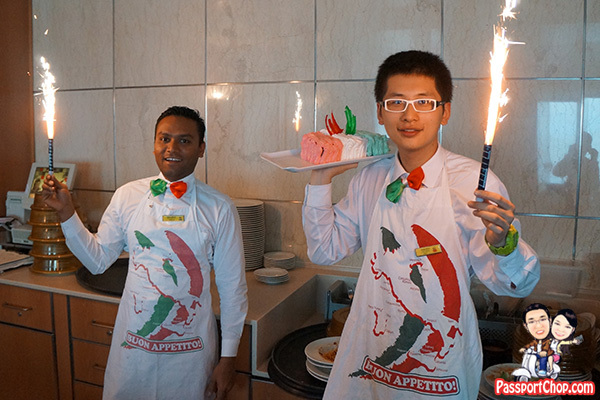 I have to say the waiters at Fantasia restaurant were just excellent – very efficient in serving the dishes and accommodating to our requests for more fries, chili sauce etc. If you crave for some late night snacks, you can check out Rustico & Salad Bar on Deck 12 Pizzeria Bella Napoli. There is an ala carte service from 8pm to 1am. 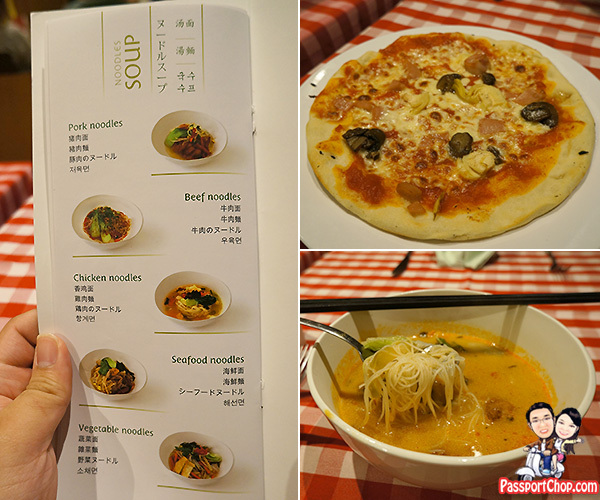 You can order pizzas and noodle soups (complimentary) – there are different pizzas for different days. Don’t expect too much of the pizza and noodle soup in terms of taste – so-so only. Costa Victoria cruise journeys vary from three to five nights travelling from Singapore to popular destinations such as Phuket in Thailand as well as Malacca, Penang and Langkawi in Malaysia. Cruise fares of these voyages start at SGD 259 per person. There are sometimes early bird discounts, including free upgrades from Inside cabins to Oceanview cabins starting at SGD 338 per person e.g. a 4-to-go special offer for booking Inside cabins on 3-night sailings starting SGD 259 per person; and a 50 per cent off offer for booking Balcony cabins on selected 3-night sailings starting at SGD 429 per person. Kids under 13 years old will also be able to enjoy a “kids cruise free” offer. that is absolutely awesome. cota victoria will be the next one on my list to try. thanks for the info guys! Can I ask about the food on board? From the article, there will be buffet on breakfast lunch and dinner, right? And the late night snack (the pizza and soup), do we have to pay for it on board or is it already include on board? yes – buffet is available bkfast, lunch, dinner. supper is also all you can eat pizza. 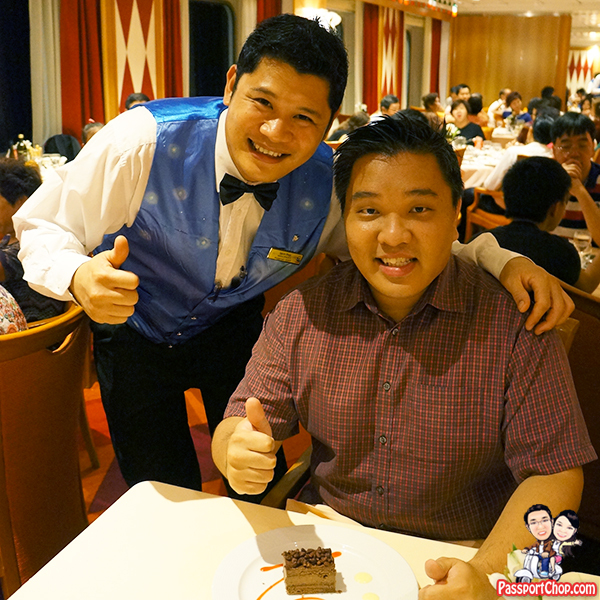 All food is included in the package – FREE but there is a restaurant where you can pay to eat more atas stuff but it is really up to you; the free food options is already quite good: fine-dining or casual buffet stuff – up to you. late night snack – all FREE and included. Tips/Gratuities are usually not included – check with your tour agency if these are included. Alcoholic drinks are chargeable – so if you are at a bar and feel like getting something to drink – be mindful that it is chargeable. Other than that, if you don’t do shopping, gamble, buy photographs, play bingo, go on Costa cruise-organised land tours (no charges for the boat to get you onto shore for the stopovers at Phuket and Langkawi), rent the foosball ball or go spa, you will not incur any extra costs. Yes – it is the envelope thing. I think when gratuities are included – they will not leave the envelope in your room. No – bingo is considered a gambling game – it is not the quiz thing that i played.